StatTrak K-ForCE allows you to score baseball and softball games play-by-play on your handheld Pocket PC. Print scoresheets and game stats from your desktop PC with viewer program included. One tap scoring allows you to score the most frequent plays with ease. Score a walk, and the runner on first is automatically advanced. Score a home run, and all runners advance to home and the batter is credited with the correct number of RBIs. Track stats for a single team, multiple teams, or a whole league. There is no limit on the number of teams or players you can track. Our baseball scoring software is based on a paper scoresheet so you'll quickly learn how to score on your Pocket PC including: Hit Location, Pitch Count, Substitutions, Score strikes as Foul, Called, or Swinging, Designated Hitter, Fielder's Choice, Auto Advance of Base Runners, At Bat Comments, Game Comments, RBIs and Earned Runs. Save games for future reference on your device. You will only ever need to type in a batter's name and number in once. After that, select the player from a popup list. Next game you score, select the team from a list, then enter the batting order from the players names and numbers retained from earlier games. 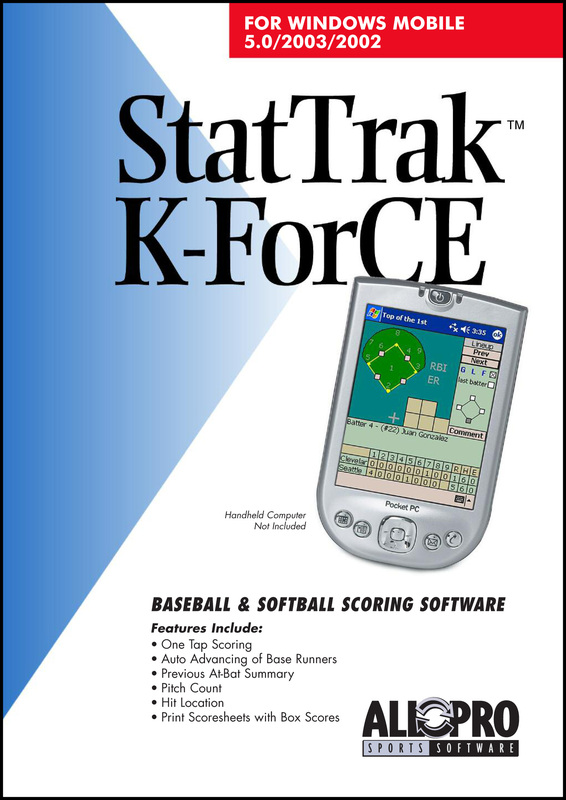 Download StatTrak K-ForCE for Pocket PC Score baseball and softball games on your PocketPC!